Frequent stomach upset and nausea? Could be a stomach ulcer, also known as a peptic ulcer , an open sore that can develop in the lining of your esophagus, stomach, or small intestine. How to get rid of ulcers or find ulcer pain relief? You first need to pinpoint the cause and then consider some home remedies for ulcers to help relieve your symptoms. Popular belief may have you thinking that stress, spicy foods, and alcohol are to blame. Although those can bring on stomach discomfort, most ulcers are caused by a bacterial infection, certain medications like aspirin and nonsteroidal anti-inflammatory pills, or smoking. The nicotine in tobacco can increase your level of stomach acid, putting you at risk for stomach ulcers. As for bacterial infection, the medical name for these bacteria is Helicobacter pylori – commonly referred to as H. pylori. About 90 percent of people with stomach ulcers have H. pylori. Interesting to note, most people in general infected with H. pylori don’t develop ulcers. The jury is still out on this one, but some experts say people with stomach ulcers may already have a problem with their stomach lining and some people secrete more stomach acid than others. Peptic ulcers may be linked to the combination of high stomach acid and the H. pylori infection. 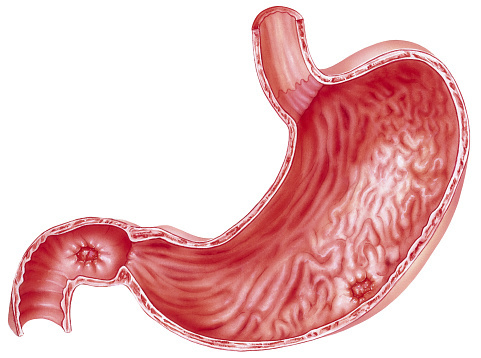 Why do stomach ulcers give people so much grief? They’re an open, painful wound. Bacteria weaken the stomach’s protective coating, so the acid gets through to the sensitive tissues lining the digestive system. The bacteria and acid work to irritate this lining, causing sores or ulcers. How do you know if you have one? The warning sign is burning pain felt anywhere from the navel to the breastbone. It’s often worse when your stomach is empty and more commonly flares up at night. It’s tricky because it can disappear and then return for a few days or weeks. Less often, too, symptoms can be more serious. The Mayo Clinic outlines the following to watch out for. If symptoms persist, see your doctor because you may require prescription antibiotics or other medication. Over-the-counter options can provide temporary relief, but there are also natural remedies for ulcers to consider. Kale and broccoli: These vitamin-rich green vegetables are also alkaline foods, helping to neutralize stomach acid. Cabbage: This often overlooked superfood produces an amino acid that boosts blood flow. More blood flow to the stomach lining can help stimulate healing. It’s also a potent source of vitamins C, K, and B6, as well as manganese, potassium, and dietary fiber. All good! Green tea: If you like your tea, try switching to green, the less-processed variety that’s very high in protective flavonoids. Bananas: The convenient and versatile tropical fruit has antibacterial properties, which are good for healing. The fruit can also help minimize the acidity of gastric juices to help reduce inflammation and strengthen the lining of the stomach. Coconuts: These tropical beauties are spending a lot of time in the limelight these days. The naturally sweet and delicious coconut meat, milk, and water are all great additions to your remedies for stomach ulcers. Most important to people with stomach ulcers, coconuts offer antibacterial properties to help soothe and heal. Licorice: Candy for your stomach ulcer? Not exactly, but licorice with the sweet part, glycyrrhizin, removed may help ulcers heal. Still tasty but not quite the childhood favorite you may remember! Fenugreek: This is an aromatic Mediterranean plant that has long pods with oblong brownish seeds inside. The seeds can be a little bitter, but they’re popular roasted and ground and used in curries. The herb has long been known for its healing properties. You can buy the fresh leaves (methi) to add to a salad. The seeds can also be used to brew as a tea – just strain the seeds and add a little honey before drinking. It’s good to know you can start right in your kitchen for natural remedies for ulcers. Good health is so reliant on the food we eat! Limit those highly acidic foods, too, like citrus fruits and red wine, which can be hard on an overly-acidic stomach. And get cooking! The more fresh, whole foods you eat (without the additives and processing of packaged and fast foods) the better your chances are of getting rid of stomach ulcers and improving your overall health.